The British bank Halifax is named after the town in Yorkshire where it started as a building society in 1853. Halifax is a trading division of the Bank of Scotland and both are subsidiaries of the Lloyds Banking Group. There are 800 Halifax branches throughout the UK. Branches tend to be open between 9am and 5pm during the week. Customers can visit a branch to get help in person with their Halifax bank account. Halifax offers 24/7 phone support, so that customers can get help outside of business hours. This means that Halifax account holders can contact the bank any time that they need to report a lost or stolen Halifax bank card. Here is what you can do about a missing card. If you have a debit card and the Halifax mobile app on your smartphone, then you do not need to panic. 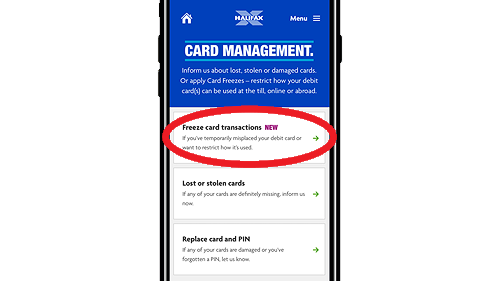 Whenever you misplace your card, you can log into the mobile app and freeze transactions. This means that if somebody else finds your card, they won’t be able to use it. Sign into the Halifax app and select “Card Management” from the main menu. 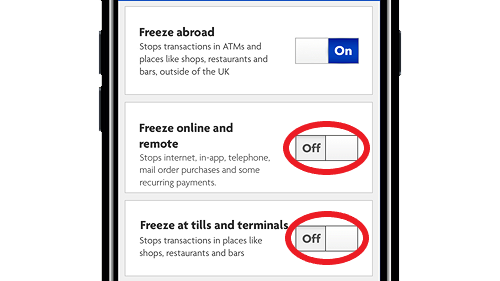 When you click on “Freeze card transactions” it will list several types of transaction which you can choose to block temporarily. You will also be able to report a lost or stolen card in the “Card Management” section of the app. Simply toggle the buttons to “On” next to all of the types of transaction to make sure that nobody can access your money while you try to find your card. If you find it, you can then log back in and unfreeze it. Or if you don’t, then you can still restrict its usage while you report it to Halifax as missing. This will prevent financial loss in the meantime. If you know that your Halifax bank card is definitely lost or stolen, then you need to report it immediately. They can cancel your card right away to block all possible transactions. This freeze function should also be available for lost Halifax credit cards as well as debit cards. When you get a replacement card, these freezes will not be applied to it. In the case of a stolen Halifax bank card, or if it is definitely lost and you know that you will not get it back, then you need to contact Halifax and cancel your bank card. If you are registered for online banking, then you can report the lost or stolen card through your online account. Sign in and submit this form to cancel a Halifax bank card. 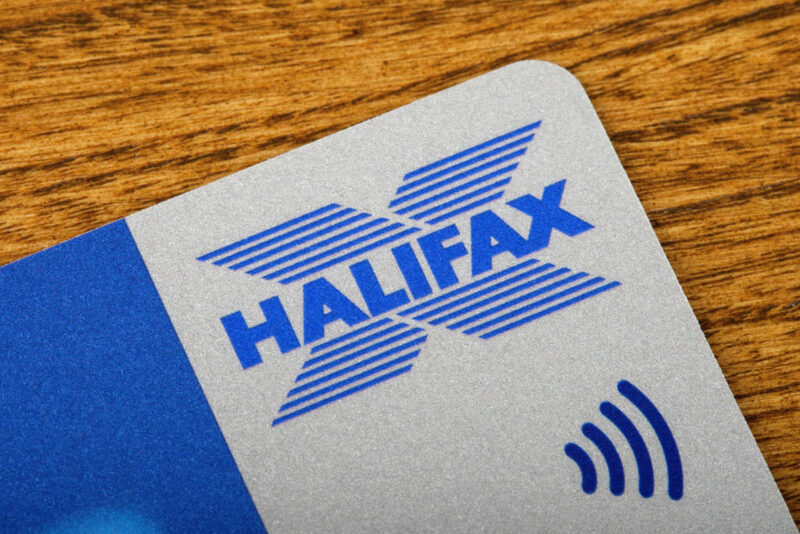 Halifax will cancel the card so it is no longer valid and send you a replacement card. You should receive the new card in the post in 3-5 working days. Remember to update your payment details and Direct Debits with your new card number. You can also request a replacement card if there is a problem with the current one, or request a replacement PIN. Submit a different online form to do this, or click on “Replace card and PIN” in the “Card Management” area of the mobile app. You can choose to replace your PIN if you think that somebody else might know it and be able to use it. When you request a replacement PIN, it can take 5-7 working days to arrive by post. Halifax cannot provide PIN details over the phone for security reasons. You will have to wait until you receive a letter with your new PIN inside. Anyone registered for telephone banking can call Halifax on 0843 557 3774 to discuss their account. You can call this number to report your bank card as being lost or stolen as soon as you realize this has happened. When you call, there will be a series of numbered options. Press 1 to discuss your bank account, or press 5 if it is specifically about a credit card. In either case, it will prompt you to say the reason for your call. Clearly say “report lost card” or “report stolen card” according to the circumstances. Alternatively, you can press 8 for the self-service options and then press 3 for replacement card requests. You will need to provide your card number or Halifax account number. Some banks offer a service allowing you to call and retrieve a code to use for withdrawing cash at an ATM. Halifax is not one of those banks, unfortunately. You cannot withdraw cash from your account at a cash machine or a Post Office without your card and PIN. However, if you have access to your account through online banking or the mobile app, then you could transfer some cash to a trusted person who can then withdraw it for you from their account at an ATM. If this is too complicated or not possible, then the easiest way to withdraw cash without your Halifax bank card is to go into a branch. You can locate your nearest Halifax bank and when this is open with their online branch finder. Halifax allows you to withdraw up to £2,500 in cash over the counter in their bank branches. However, if you do not have your card, then you will need to bring proof of your identity. They will accept a current driving licence or passport. If you do not have a valid document with your photograph on it, then they will accept other documents as proof of identity along with a document proving your address. You can find their list of acceptable documents here. Once you receive your replacement card, you can withdraw cash from an ATM as normal with a daily limit of £500.